There is much hype of late around the power and energy that certain gemstones radiate into our lives. I’ve written about it and I’ve bought into it (with one eye open!) because I’m a lover of gemstones first, and an optimistic skeptic second. But as you know if you’ve been following this endeavor, the energy behind these stones that I find more intriguing is the human energy. One stone in particular and its related humans recently captured a piece of me. It all started with a flurry of texts. Before we get there though, let’s rewind to when I first met Chelsea and Mark, the couple at the center of this story. It was late 2016 and I happened to be in London at the same time as a friend from New York who was staying with Chelsea and Mark. As fellow Canadian ex-pats, the three of us shared an easy bond over our nostalgic longing for CBC’s The National and Peter Mansbridge. Fast forward about a year and a half, Chelsea has landed an opportunity in Boston, while Mark makes a pit stop in their native Vancouver. They’re working on reuniting in New York, where Chelsea had briefly lived, and fell in love with the city, during an internship at the Clinton Foundation. And we now share a bond over the challenges and nuances of the US immigration system. And that brings us to this past June. Both Chelsea and Mark had come to me separately for some direction on their quest for an engagement ring. I knew they had an affinity for the striking simplicity of the Tiffany solitaire, but they also felt pulled towards something with character, so I pointed them in the direction of Erstwhile, one of my absolute favorite sources for vintage rings (more on Erstwhile here). Chelsea sent me a link to a vintage Tiffany solitaire at Erstwhile that she was eying and mentioned they had made an appointment to see it when they would both be in New York that weekend. A day later I woke up to a trail of texts from Mark who was planning to surprise Chelsea by proposing with that very ring the day of their supposed ring appointment. But with neither of them in New York, there was still the matter acquiring the ring. Could I go to Erstwhile to see it, Mark wanted to know? And with my blessing he would press purchase. Of course, I accepted the mission! But with only four days to go before the planned proposal, a little bit of magic was required to pull it all off. With a little help from Nikki Glick, the Managing Director at Erstwhile in New York, I arranged a last-minute appointment at their showroom. The ring was even more special than pictures can articulate. 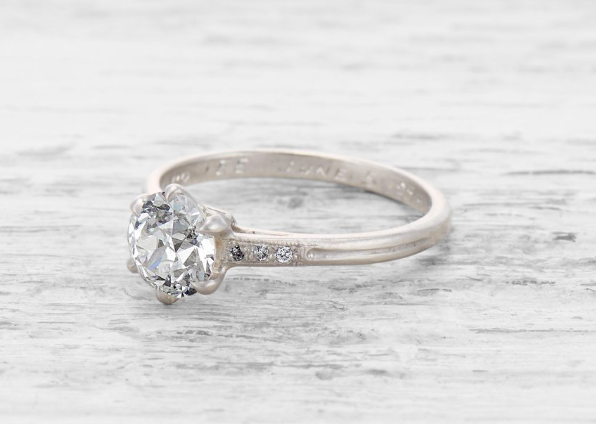 The 1.04 carat solitaire diamond is flanked on either side of the band by three bead set diamonds and there is a channel engraved down the band that gives it that true vintage character. But the real synchronicity is the engraving on the inside of the band. It reads “June 5, 1954,” which was 64 years to the day that Mark set this whole plan in motion. While I was being hypnotized by the magic of the ring, Mark was on a very anxious plane ride from Vancouver to Boston, willing all of the pieces to fall perfectly into place. When he touched down a few hours later and received my enthusiastic thumbs up (along with some very sparkly photos and videos) he bought the ring before even getting off the plane. With the ring now on its way from New York to Chelsea’s apartment in Boston, Mark had to casually intercept it so he could secretly bring it back to New York with them for what was supposed to be a weekend of ring shopping. While the suspense (!) builds, let me pause at this point in the story to tell you a bit about Chelsea and Mark. They grew up in Vancouver, BC, about a 5-minute walk away from each other. Despite going to the same high school, with Mark traveling for hockey and Chelsea equally as active (and currently training for her 4th marathon!) their paths didn’t connect until 2013. They were both finally home for a year and Chelsea was playing on a co-ed soccer team with some of Mark’s friends. With a desire for adventure and neither afraid of a challenge, they moved to London in 2015, landing in the Islington neighborhood of the city. It provided the perfect perch from which to explore the world for the intrepid couple. Both separately and together, they are extremely generous with their time and attention. The last time I saw Chelsea she gave me a just finished copy of Joan Didion’s Play it as it Lays, and she listened and provided thoughtful advice about a project I was struggling with. She told me about the not too distant passing of her father, speaking of it with timeworn grief, but also of the happy memories of celebrating his life with close family and the triumph of writing and delivering a eulogy in tribute. It’s a rare skill that Chelsea has, the ability to exude a genuine joy, excitement and find-the-silver-lining attitude even when the situation at hand may not be the rosiest. Mark is equally as considerate. Lending a hand to others isn’t a question for him, it’s just part of who he is. He has helped me work through a few equations on a few occasions and I’m so glad I could return the favor. But back to our story. Having made it safely to New York (with the ring undetected! ), the couple felt a stunning early summer day called for a picnic in Central Park near their hotel. After a venture to get some Italian meats and cheeses from Di Palo in Little Italy, (Chelsea understands in hindsight why Mark didn’t protest the out of the way trip to her favorite deli! ), they visited a few stores in Chinatown so that Mark could find the perfect Insta worthy picnic blanket. The series of synchronicities continued as they found one of few empty patches of grass in the same stretch of Central Park where Chelsea had visited with her dad during her first trip to the city. It was across from Strawberry Fields and as they sat down, the sound of The Beatles’ All You Need Is Love was wafting through the air. Wanting to make sure the proposal was captured, Mark spent the picnic strategizing who to enlist to film the moment. To his luck, while Chelsea slipped away to the restroom, he found a very enthusiastic group of Brazilian tourists willing to record. They even suggested a soundtrack of Chelsea’s favorite song, which happened to be Sea of Love by Cat Power. And with the bend of a knee, two separate love stories became linked by the same band, one in 1954 and one in 2018. I was honored to be a part of a new story in the making. And even though Chelsea thought she was seeing the ring later that day, it, and Mark, surprised her. Now that energy is truly powerful. So now you’ve heard my part in this fairy tale, but such a special moment deserves to be captured by all sides. As you know, my goal in this project was to restore my faith in love, and Mark and Chelsea’s telling of what this moment meant to them does that in spades. So here are their own impressions. Warning, I sobbed through my first reading! I think what I loved most about the whole process was the fact that Mark understood how much it meant to me to have a ring that was both unique and exactly to my taste. We spent almost six months searching and we couldn't find anything that was quite right. He was so patient with me even when I was being quite stubborn about the process; and when he saw this ring he knew instantly that it was the one. Months and months of searching, but as soon as he saw the one it was basically a matter of hours before he purchased it, even though it was slightly outside of the price range we had agreed on. Also, I was amazed at the fact that he was able to keep me in the dark the whole time. I am usually the one who does all the planning and he somehow made me feel like I had organized the whole day without realizing that it was all part of his plan. I wasn't nervous because it was a big step in our relationship, I was more nervous that it wouldn't turn out perfect. There are so many moments in our relationship that I look back on that made this decision so easy; our first road trip blasting Nirvana in the car and singing at the top of our lungs on our way down to Seattle, staying up until 3 am on a week night talking and laughing in bed, sharing a life together in a foreign country while travelling the world to experience new cultures and food together, cooking tacos and homemade Ramen in our Scandinavian themed London flat and now juggling a long distance relationship with the ultimate goal of New York City. I had this exact feeling in my stomach when I finally saw the ring I wanted to buy online from Erstwhile. After months and months of looking in London, Canada and the US, I never once had that same feeling.... Although, this ring was out of my price range, I knew this had to be the one. I have a very democratic approach when it comes to decision making, some people call this indecisiveness haha. However, I like to look at it as a joint effort to making sure that I make the best decision possible. I really value the opinion of people close to me, and I use that advice with my own instinct to come to my final decision. I used Chelsea to get an idea of what type of ring she would love to wear for the rest of her life; it had to something "unique and her." I asked Chelsea's mother, Jo, and sister, Courtney, for advice on rings and planning the proposal and my lovely and talented friend Lo for advice on jewelry, where to look, and ultimately be my eyes in person to scope out the ring that I wanted. I was anxious for the plane to land and when that time finally came, I instantaneously turned on my data and had a few messages from Lo "OMG, this is the most beautiful ring that I have ever seen. It's just like Chelsea, so beautiful with tons of character," and a video of the ring capturing its elegance. I was immediately hit with a lot of emotion as I stared at my phone and pictures of the ring over and over again, while still buckled into my airplane seat. I thought of Chelsea's smile and how happy and surprised she would be to see the exact ring we planned to look at there in person as I was kneeling. I held back tears and scrolled through the Erstwhile website to the ring online and pulled out my credit card to make the purchase - still on the plane! After I got off the plane I called Nikki at Erstwhile to ensure that the ring would be delivered in time to Boston for Friday and to not worry about fitting the ring as time was of the essence. She was amazing through the entire process, I really felt like I had a connection with her, even though we had just gone back and forth over phone and email. Nikki was very accommodating with her time and understood the significance of the purchase and the setting to where I was to propose - I recommend her to anyone traveling to NYC to make an engagement purchase. Now the hard part... to find a perfect spot. It was another feeling that came over me, the same feeling I had when I saw the ring for the first, when we turned that corner in Central Park and found that piece of grass I knew this was the perfect spot. At that moment, I thought of my mom, who passed away a few years ago when Chelsea and I first got together, I thought of Chelsea's dad and how proud and excited he would be and I thought, "Wow, I couldn't ask for a perfect setting - how did I get so lucky?" Again, more people helping make it special, a group of Brazilians celebrating a friend’s birthday, overjoyed with a stranger’s request to help be a part of a magical moment and photograph our proposal. The shots were brilliant, I blacked out and don’t remember what I said during the proposal (ha!) and we celebrated with champagne at The Boathouse in Central Park that Chelsea discovered randomly on her journey to the restroom and topped it off with a baseball game and fireworks. Now I know why so many people love New York!